Witch Games has announced that Epic Games has rejected the request to add Assault Android Cactus, an acclaimed independent title, to the Epic Games Store. Assault Android Cactus has not received the approval of Epic Games, despite the warm welcome by players. When Epic Games declared its zero-tolerance policy towards low-quality games on its digital distribution platform, many wondered what it would look like in practice. 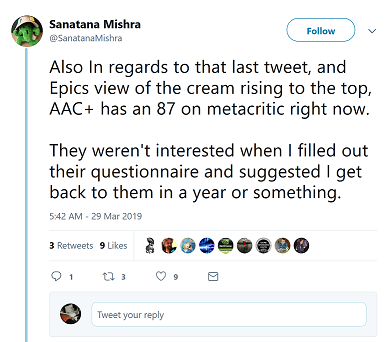 According to Witch Beam's Sanatan Mishra, it doesn't look very good. The CEO of the Australian team published several posts on Twitter after Assault Android Cactus was rejected by the Epic Games Store. The store representatives have allegedly rejected Mishra's application and suggested that he "try again next year". Some of his entries have already been deleted, but Internet users have managed to save some screenshots. The debut project from the Australian developer Witch Beam may not be a bestseller, but it has been a success. Rejecting the game of a small team in itself may not be surprising and even in line with Epic Games' "we don't want no crappy games" policy. The problem is that although Assault Android Cactus did not gain such fame as Hollow Knight (incidentally also created by the three-person studio from Australia), it does not fit the definition of a "crappy game". Assault Android Cactus was officially released on the PC in 2015, but the game has gained publicity two years earlier, when it won the award for the "Best action game" in the Intel Level Up 2013 competition. The game has several other rewards under its belt, as we can learn by looking at the game's page on Steam. Speaking of Steam, 95% of the thousands of Assault Android Cactus buyers rated the game positively - a strange thing in the case of an allegedly "crappy" game, as Epic Games put it a week ago. Similarly strange would be the subsequent releases on Sony, Microsoft and Nintendo devices, as well as the average review scores (via Metacritic) on any of these platforms, which do not fall below 79/100. So why was Assault Android Cactus rejected by the Epic Games Store? We know that the company was unlikely to have any formalized way of selecting games since only a week ago Tim Sweeney said: "I think we'll be aware of the quality of what's submitted prior to making a decision to list it in the store — somehow". Apparently, however, Epic Games' CEO's theory of "reasonable judgments" about the quality of games released on EGS doesn't seem to be working.